The All Night Bookshop was inspired by our first visit to the USA in 1992. We spent the best part of a month driving round California, starting and finishing in San Francisco. One of our first ports of call was the legendary City Lights Bookstore, co-founded by Lawrence Ferlinghetti (who is, amazingly, still alive). The bookstore stayed open until midnight, an unimaginable concept in the UK, and still an unusual one (unless a Harry Potter novel is being published). I remember which notebook I jotted down the idea in. It has a black rubber cover and is somewhere in the loft. Sue bought it for me when she visited the original Getty museum in LA. You weren’t allowed to park and the place was hard to reach, so I dropped her off for a couple of hours and went walking on Malibu beach. The notebook was a thank-you. The title I wrote, reflecting the story’s US origins, was In the All Night Bookstore, and that’s how it appeared, eight years later, when Geoff Nicholson and Martin Bax accepted it for Ambit, in what turned out to be the last of my long run of stories for that magazine. A year later, when new publisher Five Leaves was putting together a collection of my YA ghost stories, Ross Bradshaw insisted that I include ITANB, even though a) it wasn’t exactly a ghost story and b) it wasn’t a YA story. I said fine. That collection sold out over a decade ago. I did consider including the piece in my collected stories, which came out in 2016. However, it was a pre-internet story and I figured it had dated badly. Happily, I was wrong. Updating the story for the internet age was easy. Last year, Di Slaney asked me to write a story for a Candlestick Press short story pamphlet. You’ll have come across their Ten Poems about series, marketed as instead of a card, thought up by our good friend, the press’s founder, Jenny Swann, many years ago. Candlestick’s short story (and nature writing) pamphlets are a more recent innovation. I follow in the steps of Sean O’Brien. The prose is bookended by poems. I was delighted to get to choose one by Jim Burns, a Northern poetry legend (and fellow Ambit regular, a Beat enthusiast who, in his eighties, runs this review site) for the front. And at the back I’m proud to have a poem about Silver Moon Bookshop by Jackie Kay, Scotland’s makar, who has been a friend for twenty-odd years. The story is narrated by a young student who wanders into a strange bookshop with a mysterious owner, falls in love with the assistant and starts working there. It isn’t quite the same as the one published last century. To acknowledge this, I’ve anglicised the title. The piece has expanded a little, too, excellently edited by Katherine Towers, with an atmospheric cover by Steven Hubbard. 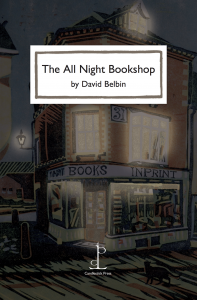 The All Night Bookshop has a semi-mythic feel that’s unlike anything else I’ve written, so it’s appropriate that it should be published as a stand-alone story. If you’ve read it before, you might consider buying this new, final version. It’s only a fiver and, once you’ve read it, you can always give it away instead of a card. Even better, why not come along to the launch which, appropriately enough, takes place on National Bookshop Day, on October 6th, and, even more appropriately, is at Five Leaves Bookshop (independent bookshop of the year! ), at the heart of Nottingham city centre, where I always imagined the story to be set. Ross will be opening late for the occasion, at 8.30pm. Alright, not quite all night but after his usual bedtime. There’ll also be a rare opportunity to see Jim Burns read, which I’m looking forward to. But if you can’t make it, you can order the book here. This entry was posted on Friday, September 21st, 2018 at 10:27 am	and is filed under Song of the Week. You can follow any responses to this entry through the RSS 2.0 feed. You can leave a response, or trackback from your own site.